Broad View Elementary in Oak Harbor, Washington. Collect white and yellow cornmeal; malt-o-meal (brown colors) and use food coloring mixed with rubbing alcohol added to white cornmeal to create additional colors if desired. On Tag board , index or cardboard have the children create a simple Native American design with their pencils. Templates could be made available for younger children. 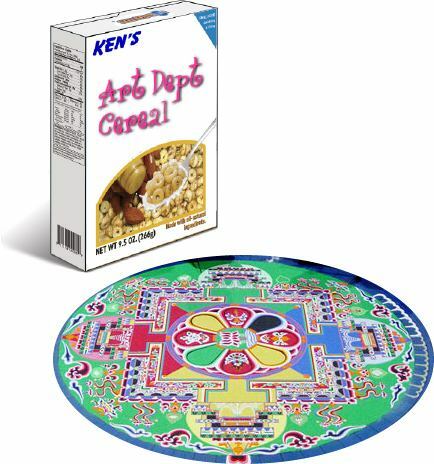 Using one color at a time, apply Elmer's school glue to the penciled in areas and sprinkle with desired color of cereal. Shake excess off. Cake pans make an excellent trays to trap the excess cereal to be reused. Move on the next color desired and repeat process. The effect is striking. Use table salt mixed with shavings of Chalk /pastels. Store separate colors is small butter dishes. You may also use colored sands. See another sand painting lesson here. Native American Designs: Create 8 Beautiful Paintings Out of Sand! - This sand painting kit contains everything that children need to create eight sand-art images based on Native American objects and designs, including a buckskin robe, a tepee, and a warbonnet, among others.